Hey! Folks today I have hunted a new method of making money online.I have come up with a website known as Fiverr which is a market place where people do work for $5.Every service provided on Fiverr is of $5.I will tell you complete about it in this Urdu & Hindi Video Tutorial You can make money online with Fiverr without any blog/website.Now let me give you guys a little information about it! Everyone can join Fiverr and sell his services online.Its easy for everyone.You just need to generate money with your talent.Just think for a while about your skills.Are you good in graphic designing? Can you design a Logo? If yes then create a Gig on Fiverr and start making money online.You can offer amost every kind of service on it for example: Online Marketing,Content Writing,Videos & Animation etc. How To Start With Fiverr? For starting on Fiverr you just need to create a free account.After creating an account set up your profile and make sure it looks professional.Here are some tips how you can make your fiverr profile look attractive: Tips For A Professional Fiverr Profile After following the tips create a Gig.For example if you are a good content writer then create a gig on content writing like ”I will write a 500 words Unique SEO Optimized article for $5” Now after title of Gig and an image to it.Then give a 500 words description about your service.Then give instructions for the buyer for example ask him what type of article he wants? What should be the length? etc. Then publish your GIG and promote it on Social Media to get more orders.Some people get order within a week but some get after 2 or 3 months.Well it all depends upon Luck and your GIG.Graphic designing,Article Writing etc are some hot cakes on Fiverr and they get orders more quickly! Payment system of it is Paypal.Each completed order gives you 4$ while 1$ is deducted by Fiverr.After completing order customer gives you a review and rating about your service that in how much time you replied and how satisfied he was from your work? 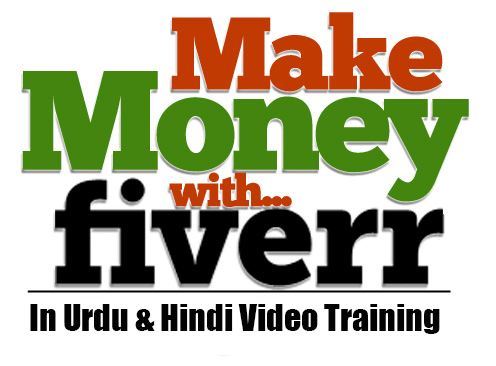 Thousands of People are working on Fiverr and are making huge income day by day.Success to Fiverr depends upon the number of orders and rating of your work.People earn in Millions by just selling Twitter Followers on Fiverr.Dont forget to read terms & conditions of it in order to understand its policies.Now watch the video tutorial below in Urdu/Hindi! Now after learning basics of Fiverr I recommend you to watch Moeed Shahid’s video on Fiverr tips.He has shared the secrets of Fiverr.You will learn how you can get more orders on Fiverr and make your profile effective etc. Here is another tutorial based on tips to boost your earnings with Fiverr. Actually its a webinar by Muhammad Faizan Khan! Having Questions? Feel free to ask.I love answering them.I always try my best to explain you and I am eagerly waiting for your response about today’s tutorial.Dont forget to share this tutorial too in order to support Us!